Back-to-back earthquakes cracked small buildings and blocked roads with minor landslides Saturday in a Philippines resort province south of Manila where jittery tourists left and patients were evacuated from a hospital amid aftershocks. Officials said an earthquake with a magnitude of 5.6 struck near Mabini town in Batangas province at midafternoon, followed shortly by a magnitude 6 quake, prompting many people to rush out of homes and beach resorts. There were no immediate reports of injuries. Video taken by Jan Paul Rodriguez shows divers swimming amid an earthquake strike.Back-to-back earthquakes cracked small buildings and blocked roads with minor landslides Saturday in a Philippines resort province south of Manila where jittery tourists left and patients were evacuated from a hospital amid aftershocks. 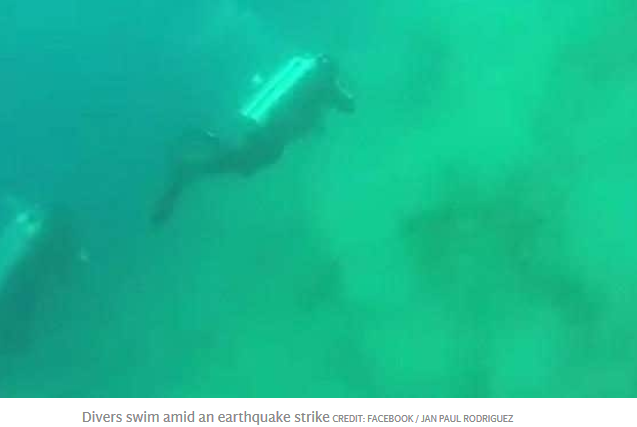 Video taken by Jan Paul Rodriguez shows divers swimming amid an earthquake strike. "Our tourists left out of fear they may be affected by the earthquakes," Mayor Noel Luistro of Mabini, which is popular for diving and snorkeling, told DZMM radio network. "I need to declare a state of calamity." Hundreds of villagers fled from their homes to higher ground, fearing a tsunami, although government seismologists did not declare any such threat. A stone church was damaged, a house collapsed and minor landslides partially blocked some roads elsewhere in Batangas, where inter-island ferries were briefly stopped from venturing to sea at the start of the summer travel season as coast guard officials made sure there was no threat of a tsunami. The Philippine Institute of Volcanology and Seismology said the first quake struck at a depth of 27 kilometers (17 miles), while the second was 24 kilometers (15 miles) deep. The U.S. Geological Survey said both were about 42 kilometers (26 miles) deep. The Philippines sits on the Pacific "Ring of Fire," where earthquakes and volcanoes are common. A magnitude 7.7 quake killed nearly 2,000 people on the northern island of Luzon in 1990.